Don’t get into the answering mode as soon as you start the exam. Many test-takers start writing before organizing their thoughts. It would be a good idea to spend few minutes in understanding exactly what the examiner is asking, forming an opinion and then formalising your writing. Justify your answers with enough details. Present both sides of the argument with examples. Be careful not to miss out on even a small point. You can go through the sample essays provided by the GRE Preparation Material experts to gain a better understanding on how to approach essay writing for the AWA section. Do not just cram up the words and their meanings. Learn to use them effectively in sentences so that they are ingrained in your memory. 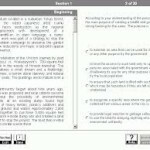 Some reputed GRE Preparation material providers have come up with theme-based flashcards which will enhance your vocabulary without making your learning boring. Stick to the study plan provided by the online GRE Preparation programme. Do not guess when you don’t know the answer. The GRE Preparation material provides you with effective techniques which will help you eliminate incorrect answer choices. Carefully weigh all the choices and beware of the “runner’s up” choices. The Sentence Equivalence, Text Completion and Reading Comprehension have questions where more than one option may seem correct. There is a very thin difference between the correct answer and the second best choice. The GRE Preparation material will give you enough practice on such questions. Read a lot of newspaper articles as this will not only improve your speed but expose you to a wide variety of topics which will help you in tackling the Reading Comprehension passages. 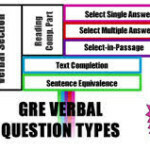 The Reading Comprehension books which are a part of the GRE Preparation material categorize the questions asked usually in the exam and have effective strategies in place to answer each type of question. Ensure to put the strategies provided by the GRE Preparation material experts into practice while doing the questions. Avoid careless mistakes in this section. Use your scratch paper and pen for solving the problems and double-check to avoid silly mistakes. Do not waste too much time on a question which you are unable to solve. Use the ‘mark and review’ feature to come back to the question later. Reserve some time to go back to these questions. Practice as many sample papers as possible from the GRE Preparation Material to get an exposure to a variety of questions which can be asked in the exam. The online video lessons from GRE instructors which are a part of the GRE Preparation material could provide you with shortcuts for questions which require lengthy calculations.